Come and join us on our walk. As with a walk, not everything becomes visible at the same time, so allow a few moments for all the pictures to load as you read along. If you would like a closer look at something, just click on the photo. When you want to return, click on "back" in your "toolbar" at the top of your screen. (Cohotate Preserve - 5 September 2001 Excursion - 01) On 5 September 2001, we went on a field trip to Cohotate Preserve, a field station of Columbia-Greene Community College. 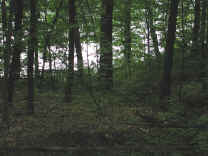 The land for Cohotate Preserve was acquired in 1991. We arrived at 9:30 AM, and were the only humans in the preserve. 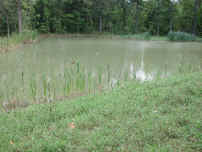 We began by walking along a gravel pathway and then turned off to look at this pond. 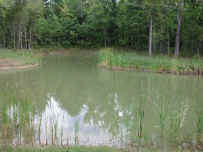 (Cohotate Preserve - 5 September 2001 Excursion - 02) This is another view of the pond with its clusters of cattails. The nice thing about such a field trip is that we get our daily exercise walking around as we enjoy God's creation. Every few meters there seems to be something of interest. 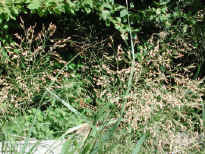 (Cohotate Preserve - 5 September 2001 Excursion - 03) This is a closer view of the cattail cluster on the eastern side of the pond. 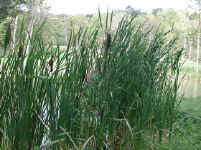 In the center of the cattails is a loosestrife plant, which has a tendency to "take over" the habitat of other species of plants. Only time will tell if this will happen here, but we suspect that since the area around the pond is being "maintained", the excess loosestrife will be "weeded out". 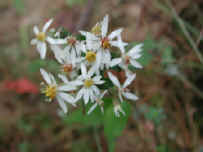 (Cohotate Preserve - 5 September 2001 Excursion - 04) On the edge of the woods on the eastern end of the pond we spotted this White Wood Aster. Cohotate Preserve is located between New York State Route 385 and the Hudson River between the towns of Catskill and Athens. 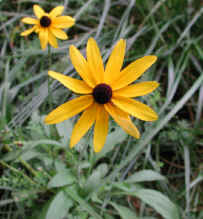 (Cohotate Preserve - 5 September 2001 Excursion - 05) Not far from the White Wood Aster were these Black-Eyed Susan plants, which are Cone Flowers, and a member of the Composite family. They were another of God's blessings this morning. (Cohotate Preserve - 5 September 2001 Excursion - 06) As we continued looking around the eastern end of the pond, we saw this wild flower, which we were unable to identify. We would appreciate the help of any of our readers with its identification. Please refer to "cohotate/5sep2001-6" when writing. (Cohotate Preserve - 5 September 2001 Excursion - 07) Even a supposedly plain patch of ground has interest if we look close enough. 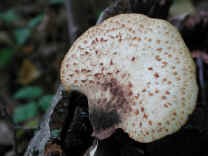 There is a young Coriolus versicolor mushroom growing on a decaying branch in the upper right hand corner of the photo. 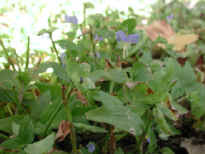 And there are several small plants growing up with the moss in the lower center of the photo. (Cohotate Preserve - 5 September 2001 Excursion - 08) We were also unable to identify this wildflower which we spotted at the edge of the woods on the eastern side of the pond. 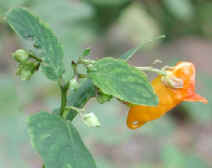 We would appreciate our readers helping us with its identification. When writing, please refer to "cohotate/5sep2001-8". 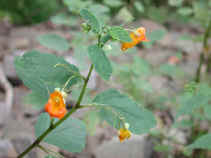 (Cohotate Preserve - 5 September 2001 Excursion - 09) As we were leaving the pond area, we saw this Spotted Touch-Me-Not (Jewelweed) on the edge of the stream bed leading out from the pond. (Cohotate Preserve - 5 September 2001 Excursion - 09a) One of the characteristics of the Spotted Touch-Me-Not or Jewelweed is the curling "spur" on the rear end (left side of flower in photo). 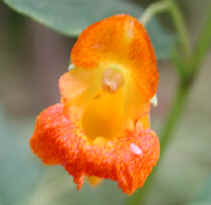 The actual size of the flower is about one inch long (front to rear). (Cohotate Preserve - 5 September 2001 Excursion - 10) This is a close-up view of the Spotted Touch-Me-Not or Jewelweed flower. (Cohotate Preserve - 5 September 2001 Excursion - 11) As we began walking down the dirt path towards the river, there was a stark contrast between the brightness of the open area around the pond and that of the deeply shadowed woods. The sunlight reflecting off the Hudson River can be seen through the trees in the upper right of the photo. (Cohotate Preserve - 5 September 2001 Excursion - 12) In this photo, we're looking along the path leading down towards the river. There is something very special about being out in the woods and knowing that none of God's creatures are going to be harmed by our presence, and that with our camera we preserve "life" for us and others to enjoy in the future. (Cohotate Preserve - 5 September 2001 Excursion - 13) As we continued down the pathway, we came to this little bridge crossing a dry drainage stream bed. This is just an example of how we can make our wild woodlands visitor accessible without harming the natural beauty and environment. 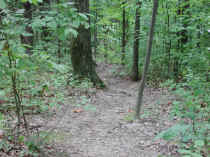 We also like the fact that no hunting or trapping is permitted in this preserve. We can all enjoy the wildlife without harming them. (Cohotate Preserve - 5 September 2001 Excursion - 14) Continuing down the path towards the river, we came upon this very interesting cluster of berries, which look like little eyes on stems. 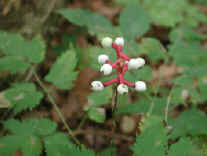 They are the berries of the White Baneberry (Actaea pahypoda). 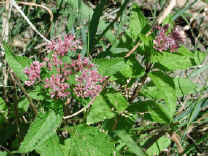 This is a medicinal plant used by the Indians for a variety of ills (primarily female ones). 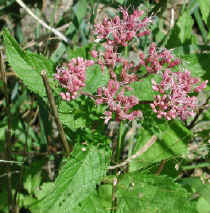 Our thanks to Jim J. for identifying this plant for us. (Cohotate Preserve - 5 September 2001 Excursion - 15) As we neared the Hudson River, we pointed our camera in that direction to capture the sharp contrast between the brilliant light-reflecting water and the deeply shadowed woodland. 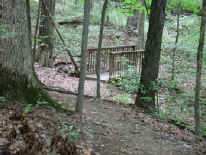 In the left center of the photo is another of the little bridges that cross the drainage stream beds. (Cohotate Preserve - 5 September 2001 Excursion - 16) On the top of the river embankment, a small observation platform had been constructed where we could look eastward across the Hudson River. The cloud formations this morning were very beautiful, so we captured a few with our digital camera. (Cohotate Preserve - 5 September 2001 Excursion - 16a) This is another photo of the cloud formations we saw as we looked eastward across the Hudson River. (Cohotate Preserve - 5 September 2001 Excursion - 16b) As we were looking out upon the Hudson River, we saw this pleasure craft heading south. This boat contrasts the quiet natural beauty of our Cohotate Preserve morning walk with that of a mechanized means of enjoying our environment. (Cohotate Preserve - 5 September 2001 Excursion - 16c) In this photo we are looking eastward across the Hudson River. (Cohotate Preserve - 5 September 2001 Excursion - 17) This is a view of the Hudson River looking southward. 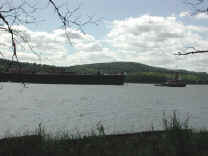 The Rip Van Winkle Bridge is in the background, and under the bridge can be seen the oil "tank farm" at Catskill, contrasting the commercial with the natural beauty of God's creation. 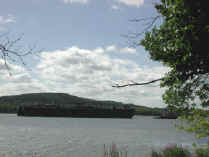 (Cohotate Preserve - 5 September 2001 Excursion - 18) There is also a fair amount of commercial traffic on the Hudson River. This freighter is heading southbound to the Atlantic Ocean. 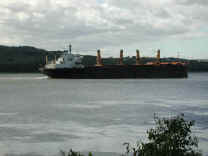 (Cohotate Preserve - 5 September 2001 Excursion - 19) This is another view of the southbound freighter. (Cohotate Preserve - 5 September 2001 Excursion - 20) After photographing the commercial things around us, we resumed our nature walk down to the shore of the Hudson River. 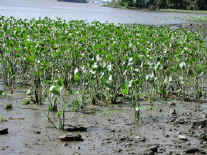 The tide was going out and exposed the mud flats of the Arrowroot plants. This shallow inlet was used by the ice industry, before the advent of our modern refrigeration, to harvest the winter ice, which was stored in large insulated buildings for use in warmer weather. (Cohotate Preserve - 5 September 2001 Excursion - 21) Like flag waving parade goers, stands of grass lined the Hudson River shoreline swaying their seeded tops as the river flowed by. (Cohotate Preserve - 5 September 2001 Excursion - 22) These wildflowers were also growing along the shore of the Hudson River. 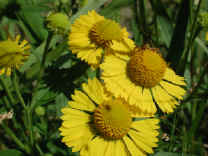 From the leaf and flower structure, we believe they are one of the approximately twenty-five species of Sneezeweed, but we could not further identify it. If one of our readers can help with a more specific identification, we would appreciate it. Please refer to "cohotate/5sep2001-22" when writing. (Cohotate Preserve - 5 September 2001 Excursion - 23) Sneezeweeds are members of the Composite or aster family, and closely resemble some species of Cone Flowers and Sunflowers. This photo (enlarged) is approximately ten times normal size. 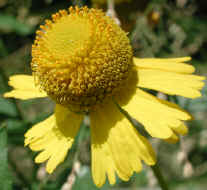 (Cohotate Preserve - 5 September 2001 Excursion - 24) This is a better view of the central cone of the Sneezeweed. We are always in awe of the multitude and magnificence of God's creation. 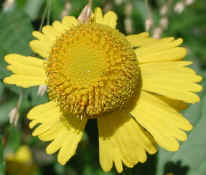 (Cohotate Preserve - 5 September 2001 Excursion - 25) We didn't even sneeze once while enjoying the Sneezeweed (:-)). 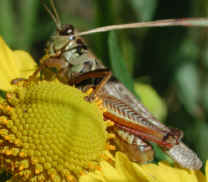 Obviously, neither did the grasshopper. Can you spot him or her?. (Cohotate Preserve - 5 September 2001 Excursion - 26) Friend Grasshopper began to move around on the Sneezeweed so that we could get a few more photos. Thou didst weave me in my mother's womb. 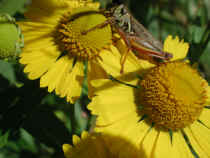 We humans are not the only beings that have been fearfully and wonderfully made; surely Friend Grasshopper was made this way, too, as was the Sneezeweed...After taking this photo, we thanked Friend Grasshopper, and the Lord, and continued on our nature walk. 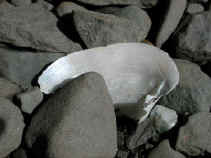 (Cohotate Preserve - 5 September 2001 Excursion - 28) The flash of light off of the mother-of-pearl lining of this fresh water shell lying among the dark gravel of the shoreline caught our attention next. (Cohotate Preserve - 5 September 2001 Excursion - 29) This wildflower was also growing along the Hudson River shoreline, and it's another of those we weren't able to identify. We would appreciate any help that our readers can give us with its identification. When writing, please refer to "cohotate/5sep2001-29". (Cohotate Preserve - 5 September 2001 Excursion - 30) This is another photo of this unidentified wildflower. 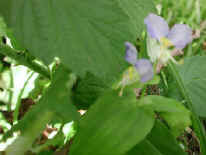 We were hoping that the flower on the right, which shows its stock, leaves, and flower would help in its identification. There is always something new to learn! (Cohotate Preserve - 5 September 2001 Excursion - 31) After taking a few more steps along the shoreline, we spotted this Turtlehead wildflower partially hidden as it grew among the tall grass. 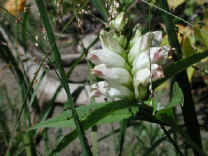 The Turtlehead (Chelone glabra), a member of the Figwort family, is considered to be rare and endangered. It was another blessing of our morning nature walk. 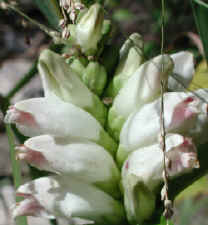 (Cohotate Preserve - 5 September 2001 Excursion - 31a) The Turtlehead gets its name from its scientific Greek name, Chelone, which means tortoise, so called because the corolla of each flower looks like the head of a turtle sticking out from its shell. 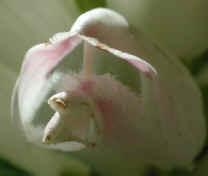 (Cohotate Preserve - 5 September 2001 Excursion - 32) This is an intimate, 20-25 times actual size, bee's-eye view of one of the Turtlehead flowers. 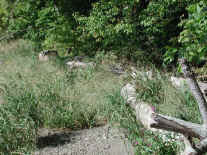 (Cohotate Preserve - 5 September 2001 Excursion - 33) Driftwood lines this portion of the Hudson River shoreline. (Cohotate Preserve - 5 September 2001 Excursion - 34) We left the Hudson River shoreline and continued on our nature walk. 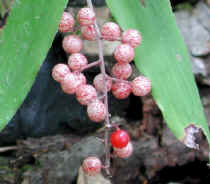 Shortly, we spotted the berries on this False Solomon's Seal and took this picture. 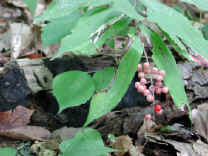 (Cohotate Preserve - 5 September 2001 Excursion - 34a) We enlarged this photo of the False Solomon's Seal berries to give a better view of the speckled pattern of the unripe berries and the single ripe ruby-red berry. (Cohotate Preserve - 5 September 2001 Excursion - 35) After going only a few more steps up the pathway, we spotted this Polyporellus squamosus mushroom to our left and stopped to take this photo. (Cohotate Preserve - 5 September 2001 Excursion - 36) And then there was more "fungus among us"! 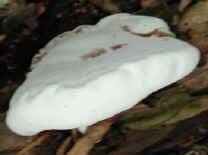 This time it was this pure white mushroom growing on a decaying log. 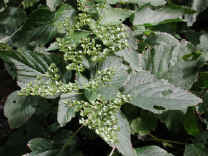 We have not been able to identify it. If any of our readers can identify it, we would appreciate it. Please refer to "cohotate/5sep2001-36" when writing. (Cohotate Preserve - 5 September 2001 Excursion - 37) To help in its identification, this is another view of the same unknown mushroom. 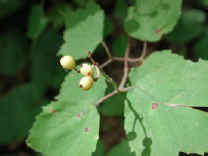 (Cohotate Preserve - 5 September 2001 Excursion - 38) A little farther up the path, our eyes caught sight of this unknown plant with its three berries. We would appreciate hearing from any of our readers who can identify it. Please refer to "cohotate/5sep2001-38" when writing. (Cohotate Preserve - 5 September 2001 Excursion - 39) A little farther up the path, our eyes caught sight of this unknown plant with its three berries. We would appreciate hearing from any of our readers who can identify it. Please refer to "cohotate/5sep2001-38" when writing. (Cohotate Preserve - 5 September 2001 Excursion - 40) As we continued walking along the dirt path, we came to an opening in the trees where we took this picture of a Hudson River cove. 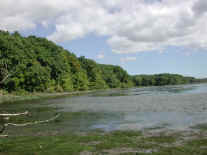 The peninsula is also part of Cohotate Preserve, and was part of a former ice-house landing. 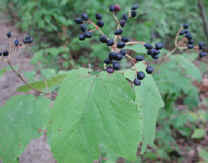 (Cohotate Preserve - 5 September 2001 Excursion - 41) Based upon the leaf structure of this plant, these dark blue berries seem to belong to the same type of plant as the white ones we photographed previously. (Cohotate Preserve - 5 September 2001 Excursion - 42) "No 911 address!" 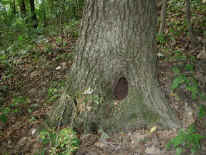 We could not tell whether or not this tree home was occupied. The center of this living tree appears to have rotted and become hollow, providing potential living space for a variety of forest creatures. 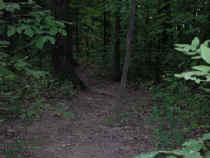 (Cohotate Preserve - 5 September 2001 Excursion - 43) The dirt path we had been following ended at the gravel access road. 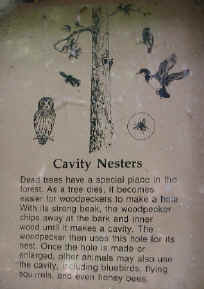 This educational sign was posted on one of the trees on the road near the education building and "park" by the river. (Cohotate Preserve - 5 September 2001 Excursion - 44) We took this photo from the park area looking northward up the Hudson River. This river was at it's pristine beauty when our country was founded. Over the years, it became more and more industrialized, and the Hudson became badly polluted. It is now recovering, but it's unlikely to improve to it's original condition, because our society wants the advantages that industrialization brings. The electrical transmission lines and towers are a case in point. (Cohotate Preserve - 5 September 2001 Excursion - 45) We took this photo from the same location as the previous one. 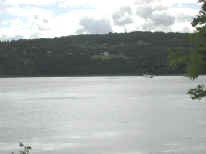 We are looking northward along the western bank of the Hudson River. 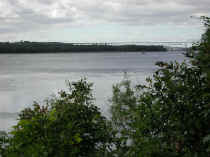 The area where we walked along the shoreline is just to the right of the center of the photo, and just above the smooth patch of water. 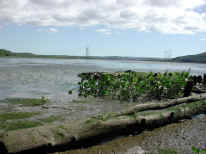 A piece of "white" driftwood can also be seen on the shore in that location. This photo also shows that we can have areas of recovered pristine beauty, even in the midst of industrialization. 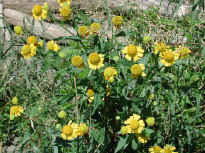 (Cohotate Preserve - 5 September 2001 Excursion - 46) On the eastern end of the park area, Asiatic Dayflowers were growing. 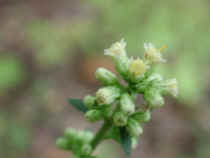 The flower facing toward the camera is about its actual size. 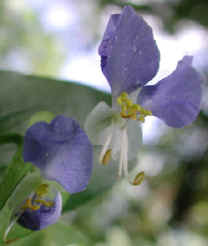 (Cohotate Preserve - 5 September 2001 Excursion - 47) This is another photo of the Asiatic Dayflowers. (Cohotate Preserve - 5 September 2001 Excursion - 48) We found this plant very interesting, but could not identify it. 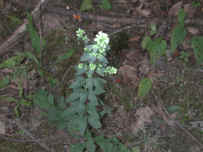 It was growing on the eastern side of the park area. 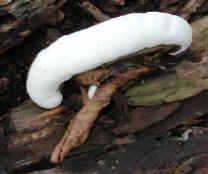 We would appreciate the help of any of our readers in identifying it. Please refer to "cohotate/5sep2001-48" when writing. 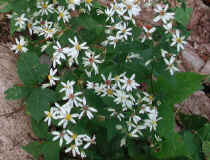 (Cohotate Preserve - 5 September 2001 Excursion - 49) On the eastern end of the park area, we also found this patch of White Wood Asters growing at the base of a large tree. (Cohotate Preserve - 5 September 2001 Excursion - 50) While we were in the park area this tug-drawn empty barge came down the river. (Cohotate Preserve - 5 September 2001 Excursion - 51) This is a final look at the southbound tug and barge before we return to completing our nature walk. The occasional commercial traffic doesn't harm any of the beauty, even when it's in the same picture. (Cohotate Preserve - 5 September 2001 Excursion - 52) As we were leaving, we spotted another Asiatic Dayflower in an area that was more sheltered from the wind, which allowed us to take this close-up picture. All in all, this was a thoroughly enjoyable morning, and we walked back to our car and went home to have brunch. 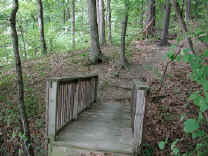 We hope you have enjoyed this nature walk in Cohotate Preserve as much as we did.